THE guys were the first to hit the cutting room floor on The Voice. The results of the first public vote were revealed and two male singers each from Seal and Delta Goodrem's teams were sent home. The coaches farewelled Ben Bennett, Matt Hetherington, Michael Duchesne and Sam Ludeman. 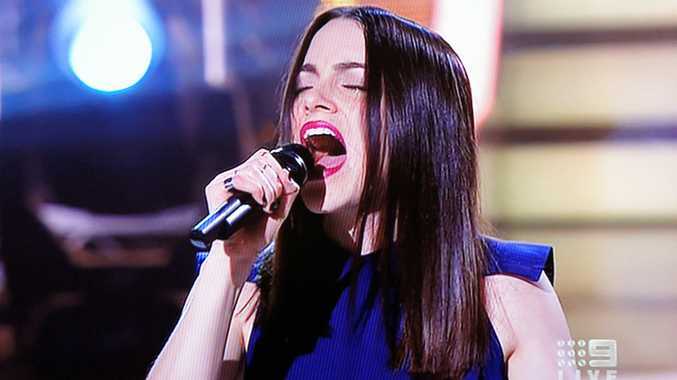 The four singers who won the public vote were all women: Emma Louise Birdsall and Karise Eden from Team Seal and Viktoria Bolonina and Rachael Leahcar from Team Delta. Seal then chose to keep young singers Fatai Veamatahau and Chris Sebastian on his team. Goodrem chose experienced singers Glenn Cunningham and Danni da Ros for her final four. Sunshine Coast singer Darren Percival kicked off the live performances with a soulful rendition of Paul Young's Wherever I Lay My Hat. Then it was up to Prinnie Stevens to prove her doubters after coach Joel Madden picked her over Mahalia Barnes in the battle rounds. The mum channeled Beyonce as she gave a sultry performance of Nicki Minaj's Turn Me On. Speaking of Beyonce, Sarah De Bono proved to be as hot as her hair colour with her performance of Listen. "Tonight Australia witnessed you becoming the star that I knew you were," Madden said. "If you didn't kill this one then you would have totally screwed this up. It was sink or swim." Rocker Jimmy Cupples battled through sickness to deliver a toned down but still powerful rendition of Sweet Child of Mine. Young singer Ben Hazlewood proudly displayed his new tattoo, which he got with Team Madden earlier in the week, as he performed Ed Sheeran's Lego House. It was important for Hazlewood to show that his emotional battle round performance was not just a fluke. Youth worker Taga Paa had a few pitch issues with his performance of Jason Derulo's Fight For You. Seal questioned Paa bringing dancers up on stage but coach Keith Urban defended the move as "entertaining". Classically trained singer Laura Bunting took a punt on a spooky rendition of Gotye's mega-hit Somebody That I Used to Know. It was a miss for Goodrem but Madden enjoyed her quirky take on the break-up song. "When you're doing a song that's so big around the world, people are always going to judge it based on the song," he said. "I just thought your interpretation was cool." The biggest performance of the night went to Diana Rouvas. The coaches and studio audience gave her a standing ovation after she gave it all with Beyonce's Love On Top. "You gave me goosebumps," Goodrem said. Perhaps the most anticipated performance of the night, Lakyn Heperi sang to Youth Group's Forever Young without the company of his trusty guitar. "I feel like I have to put you through the fire," Madden said. "You're fast tracking to a whole other thing man and I want you to be ready for it." Seal said Heperi looked disinterested while Madden defended the introverted teen. Nineteen-year-old Brittany Cairns closed the show with ballad Different Worlds. The coaches praised Cairns for thanking the band and being "professional". Tonight's episode also featured Madden breaking the news to Carmen Smith that she had to leave the show after starring in Guy Sebastian's new song Gold. "My job as your coach is to give you each a fair shot," Madden said. "There are rules of engagement and she broke the rules. I had high hopes for Carmen. It broke my heart." Voting for tonight's contestants is open until noon next Monday, May 28.